Yes, yes, that word usually describes the DaVerse Lounge experience, whether you’re reading on the stage or receiving in the audience. But this one, this DaVerse Lounge event Friday, Nov. 11, at Life in Deep Ellum, was especially empowering. We had homeschooled sisters, college students, middle school dreamers, a recent high school graduate and a local hip-hop artist, among many others, pouring their emotions onto a receptive, loving crowd of 500. So we thought we’d reminisce the evening with a baker’s dozen One Line Wonders, just to remind us how powerful sharing our thoughts and feelings can truly be. — A lament about moving, and the uncertainty that comes with instability. — Standing up against abuse, from love to politics, emotions to physicality. — Looking in the mirror of humanity. — Life as seen through the lens of an adolescent. — An ode to a best friend, and to life. — Judge people by what they say, and nothing else. — The generational pain that forces you to be strong against obstacles. — The devastating aftermath of a tragic suicide. — Anger from a woman scorned. — The state of the country and the world today. — Changing your life around through faith before it’s too late. — A cathartic note to an ex-lover. Is it a heartbreaking, painful tale? Or is it love and light? Maybe you share something clever, funny. Perhaps it’s exercise for your creativity. Share your six word story soonest. DaVerse Lounge is the event Friday. Life In Deep Ellum, the venue. We’re ready to receive your tale. The inspirational genesis of the six word stories movement comes from Ernest Hemingway’s famous short but potent 1920s narrative – “For sale: baby shoes, never worn.” Six word stories would later become known as flash fiction. For decades this extremely succinct piece of prose has been testing writers’ abilities to craft mini masterpieces for receiving readers. Jump to 2012 and the six word stories phenomenon picked up steam on Reddit, then lit the Tumblr constituency a mere two years later. 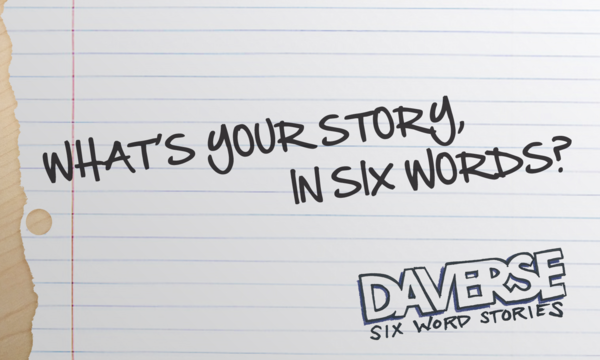 The rules of six word stories are pretty basic – write six words. That’s it. You can be as creative, ingenious, heartfelt or funny as you like, but it must only be six words. And now, back to six words. Six word stories table is ready. See space between henna, artist stations. DaVerse Lounge will provide pen, paper. We want your bold, honest expression. Stories are shared on social media. Or tag #SixWordStories_Daverse and we’ll repost. DaVerse Lounge’s 12th season continues Friday, Nov. 11th from 7-10 pm at Life in Deep Ellum. DaVerse Lounge thanks TACA, Dallas Mavericks, and State Farm for their generous support. The 12th season of DaVerse Lounge splashed onto Life in Deep Ellum Friday, Oct. 7. We welcomed 358 guests, from readers to receivers, for the 3-hour emotional literacy love fest. Among the array of spoken word poets we watched five performers do a little freestylin’. That always stirs up plenty of excitement among the audience. But so do the words, because words are powerful. So let’s take a look at a dozen One Line Wonders and relive the magic of the evening and the potency of the sentiments. – A lovesick manifesto written as a poem that shot straight to the soul. – Truly potent, nerve-rattling piece about escaping a toxic relationship. – Simple words about self-empowerment that strike a universal chord. – Proof that fixing the man in the mirror is a pathway to the stars. – Be independent, not a statistic, and learn from those around you. – The news of the day, police brutality against black men, via heavy, thought-provoking words. – The plight of foreigners learning a new language as a ticket to US prosperity. – Stop the bullying, and always make the bullied strong. – A dramatic declaration about hopes and dreams. – When a relationship is slowly dying you’ll try anything to resuscitate it. – Toxic love tastes good, but then you must swallow the poison. Spoken word is a calling. Engaging in the kind of self-expression that means baring your soul through poetry in front of a receptive audience isn’t a choice. It’s a necessity. The members of the Spoken Word Poetry club at Sam Houston High School in Arlington need this essential nutrient. For them it’s a matter of survival, like food and water. In the last four years, these teens have almost singlehandedly built a 15-member club officially sanctioned by DaVerse Works, the middle and high school arm of DaVerse Lounge, a joint partnership between Big Thought and Journeyman Ink. 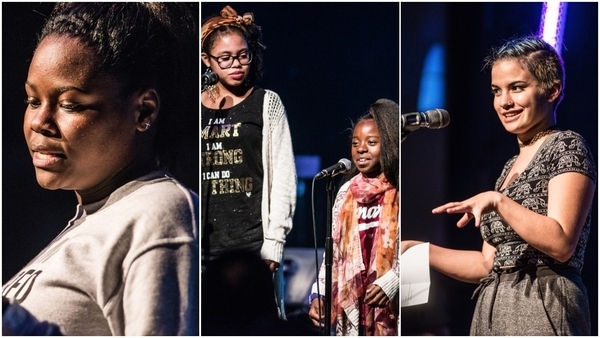 Led by a dynamo Sam Houston faculty sponsor, Chezelle Fiske, and equipped with the DaVerse curriculum, the school’s Spoken Word Poetry club continues to grow organically. Members meet every Monday at the school’s Little Theater from 3 to 4:30 pm. 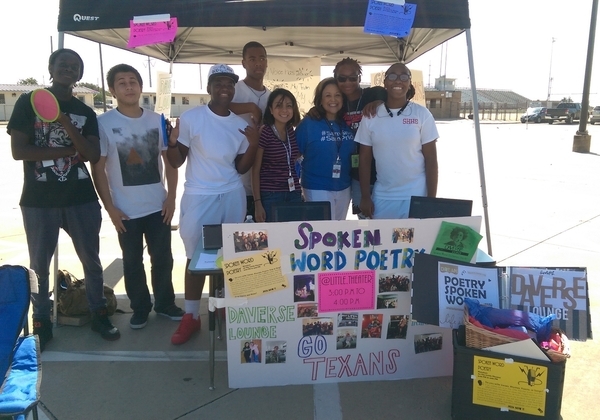 At the recent Sam Houston High School Activities Fair, held October 5 just outside the courtyard, Fiske and her dedicated kids were representing in full force. They set up a quaint booth that featured lots of glitter, performance pictures, DaVerse Lounge memorabilia, flyers, brochures, and great video footage. But it does have plenty of reinforcement. 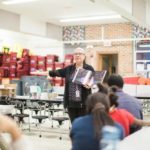 Ricardo Garza, a renowned spoken word instructor who personally knows DaVerse Lounge creator Will Richey and Dallas Youth Poets founder Joaquin Zihuatanejo, is Sam Houston’s spoken word teacher and also a Big Thought teaching artist. Richey and DaVerse Lounge mentor Alejandro Perez Jr. have held spoken word assemblies on campus. Spoken Word Poetry club president Michael Buentello, a 17-year-old senior, has read on the DaVerse Lounge stage. His personal journey with spoken word inspired fellow classmates he’s watched transform since their involvement in the movement. For Spoken Word Poetry club vice president Savanah Jackson, another 17-year-old senior, this is her way of coping with the complications inherent while navigating the teenage minefield in 2016. The Spoken Word Poetry club keeps growing – 25 members is the goal – and the enthusiasm for DaVerse Lounge remains passionate. The club will put on two performances at the school Oct. 13, at 9:15 am and 5:30 pm, fueled by DaVerse Lounge. SWP members are ready to make the pilgrimages to upcoming DaVerse Lounge events Nov. 11, Dec. 9, Feb. 3, March 3 and April 7 at Life in Deep Ellum. Your best friend – that free-spirited, creatively sparked buddy that always makes you feel special, worthy – took a summer vacation. But now this cherished companion is back, ready to provide a safe haven for self-expression. We’re talking about DaVerse Lounge, the spoken word movement that’s been a cultural signpost since its inception in 2005. DaVerse Lounge kicks off its 12th season October 7 from 7-10 pm at Life in Deep Ellum. That’s a milestone show that ushers in a new era. DaVerse Lounge Season 12 will feature six events instead of the customary four. The expanded spate of shows is in direct response to the local and educational groundswell created at each DaVerse Lounge. In addition to the October 7 kick-off extravaganza, catch the DaVerse magic Nov. 11, Dec. 9, Feb. 3, March 3 and April 7, all at Life in Deep Ellum. So what does the return of DaVerse Lounge mean? 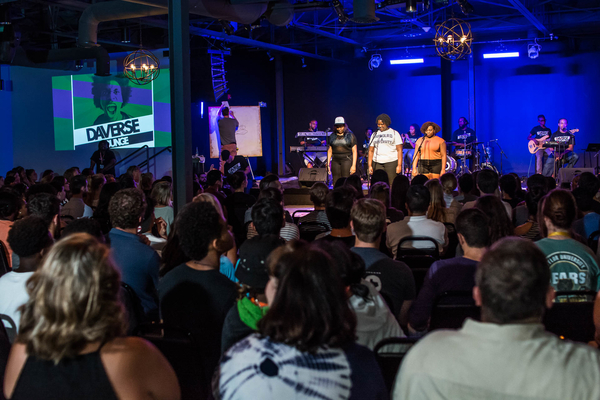 For more than 2,600 participants that have already stepped on the DaVerse Lounge stage, it means the chance to read again, to express their most intimate thoughts before a receptive audience. For countless other hopefuls, it means the opportunity to be heard, to be instantly accepted. For the approximately 600 readers and listeners that attend each DaVerse Lounge, it means another evening basking in a free-flowing environment that welcomes and nurtures youth as well as adults with raw, honest spoken word, R&B-jazz music from Melody Memory bandleader and DaVerse Lounge mentor Alejandro Perez Jr., and impromptu painting. What does DaVerse Lounge mean to the people behind the scenes – and in front of the crowd? DaVerse Lounge means unconditional love and soulful acceptance. DaVerse Lounge means a cross pollination of the arts, culture, and communities reigniting creative conversation. DaVerse Lounge means using my bravery to not only share, but mostly to listen. DaVerse Lounge means freedom for teens around the Metroplex, the opportunity to speak and be heard. The 2016-2017 season of DaVerse Lounge, a partnership between Big Thought and Journeyman Ink, promises a series of thematic shows. While those themes are still evolving, they will include collaborations with 29 Pieces, The Original Carter Literary Society (David W. Carter High School), and Big Thought’s Creative Solutions. Anticipation is high as season 11 concluded on a decidedly electric high note. The April 2016 DaVerse Lounge drew 640 attendees, the largest turnout of the season. Forty-one students performed; 28 high schools, 13 middle schools, 3 elementary schools and 2 colleges were in the house; 17 of those schools were outside of the Dallas city limits, including McKinney, Mansfield, Greenville and Sam Houston high schools; and 13 Big Thought-supported DaVerse clubs attended. Big Thought partnered with DaVerse Lounge and Richey’s own Journeyman Ink in 2009, after DaVerse’s first four years at the Dallas Theater Center. 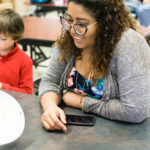 The relationship has been symbiotic, fueled by a three-tiered approach that includes learning via a school curriculum, practicing with the after-school DaVerse Works clubs, and performing at the DaVerse Lounge open-mic events. 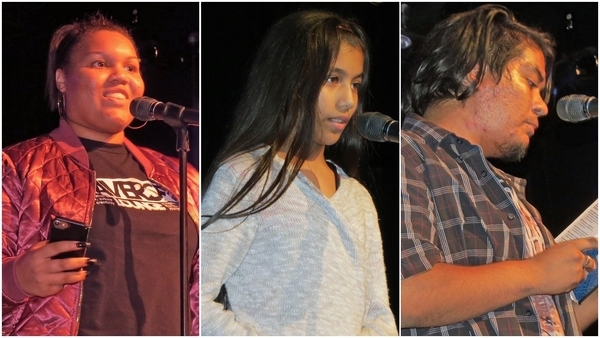 More than 200 DaVerse Works poetry club members use their own middle and high schools as platforms for self-expression. So you see, DaVerse Lounge is that cherished best friend that means many things to many of us. One sentiment is certainly universal: We’re so happy it’s back. DaVerse Lounge thanks TACA, Dallas Mavericks, and State Farm for generously supporting DaVerse Lounge. Marcus Villagomez was 7 years old in 2005, an impressionable kid sitting in the Dallas Theater Center audience for the inaugural DaVerse Lounge show. His mom, Brenda Villagomez, brought Marcus along with a van full of young ladies from the nonprofit organization Girls, Inc.
Eleven years later, Brenda and Marcus have attended nearly every DaVerse Lounge event. They know DaVerse creator Will Richey personally. They remember poems and poets by name. They’ve grown up and bonded thanks to DaVerse Lounge. 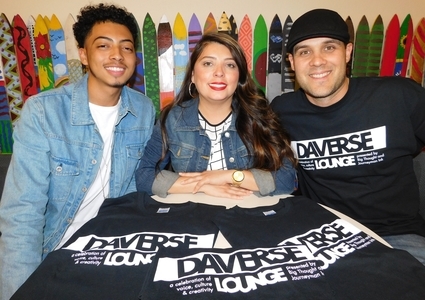 For the Villagomez mother and son team, DaVerse Lounge has been a rite of passage. The shows and their empowering mantra – My voice has power to speak my truth and share my light – filled a void just as it promoted unity and conversation. Marcus, who never took the stage to perform, breathed in all of the social-emotional learning pixie dust permeating the DaVerse oxygen. Brenda nurtured a beautiful rapport with her son. Together they resiliently coped through divorce and abandonment with DaVerse as the uplifting backdrop. The Villagomez meets DaVerse Lounge story dates back to the beginning of the new millennium. It was Brenda who first discovered Richey in 2002. She took her Girls, Inc. kids to see Maya Angelou at the Coliseum inside the University of North Texas at Denton. Richey was Angelou’s opening act. She did see it, repeatedly. Brenda was always there, with Marcus by her side. But this wasn’t just feel-good fandom. Brenda and Marcus found acceptance, boundless expression and, yes, even therapy at DaVerse Lounge. Marcus’ father walked out of his life when he was 6. So mother and son were dealing with emotions bottled up inside, emotions desperately in need of release. They embraced the welcoming, free-forum atmosphere of the shows. They became part of the firmament simply by being regular cheerleaders in the audience. Richey preaches the DaVerse Lounge gospel regularly, and not just when he’s onstage at Life In Deep Ellum, the venue that has hosted DaVerse Lounge since 2010. DaVerse Lounge’s “emotional literacy,” that ambiance of openness and fairness, is a balm for all ages, races and genders. This is all about the back and forth, the spirit of giving and receiving. Through DaVerse Lounge Marcus learned to give, which in turn allowed him to receive. Marcus now sports a short, curly coif. But back in 3rd grade his hair trailed passed his shoulders. That’s when he made an important decision. Two years later, with his mane down to his waist, Marcus cut it all off and donated it to Locks of Love. Richey caught up with Marcus and Brenda after the 11th season closing DaVerse Lounge show April 1. As they all sat and chatted at Big Thought’s office last week the camaraderie, the exchanges were so casual, so genuine. These were old friends catching up. Brenda and Marcus Villagomez are still around, and they aren’t going anywhere. DaVerse Lounge still has the same impact it did in 2005. Their DaVerse journey still resonates.